Movavi Video Editor: Is it the Best Video Editing Software on a Budget? Video Editors are the most crucial part of video content creation. No matter how great lens you’ve utilized, it all goes to the junkyard if you do not have a capable video editor to show the essence of your video content. Previously we have shared best video editing software. But not all video editors are in the budget of every people. If you are on a tight budget and looking for a top-notch video editing software that offers many valuable features and does justice with a price tag, you are at right place. Today, we are going to talk about Movavi Video Editor which is one of the best video editor money can buy. Here, we’ve got a copy of Movavi Video Editor to review. 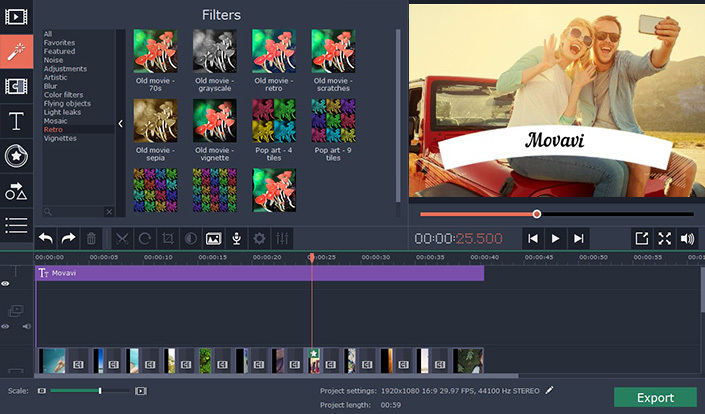 Movavi Video Editor may not be a crazy editing tool like Adobe Premiere Pro, but if you are into the stuff where time matters, you could make use of Movavi video editing software to create a professional video with minimal effort. The set of features offered seems to be very promising. However, to find out the true potential, we’ll have to review it for you so that you can decide whether to grab one for yourself. The video editor is available on both Windows and Mac platforms. Linux isn’t supported at the moment – nor do we have any information on it. The alternative video editors available with a similar set of features weighs in at least 300-400 MB in size (not to mention a name!). However, Movavi has impressed us! The setup size (offline installer) is 54.2 MB (on Windows) and 63.6 MB (on Mac) in size. There’s nothing to be downloaded after that. You will be all set after downloading this file. It’s that simple! No unnecessary downloads of additional files, nothing else – something we liked a lot about Movavi video editor. So, you will be sure that you’d have a video editor that does not hog up unnecessary storage space on your system. It’s a lite version of a proper video editor on which you can still do a lot of things a professional needs. The user interface is good enough. It’s nothing sort of confusing. If you’ve used any kind of video editors previously and know what’s where usually, you will be just fine. It does look pretty decent and is responsive as well. Of course, you won’t get a lot of options to choose from while interacting with the interface. However, whatever elements it offers (or supports) are presented in the best possible way. The UI is clean, intuitive, and easy to use. Who doesn’t like that? If you are a super advanced user, it will let you down. However, if you only need the basic set of tools with a couple of interesting features, Movavi Video editor will do the work for you. Without explaining everything at a glance, let us take a look at each of the features offered in details. Filters: The video editors must include numerous filters to adjust how the video looks like. If you put a filter with a windy concept, the video literally seems to be shot right around the same time. Titles: While you don’t have the ability to use title templates as you could with After Effects or Adobe Premiere Pro but you do have several in-built title templates that are very impressive! No, it’s not just any basic title word art design, but professional-looking title templates included that you would love! 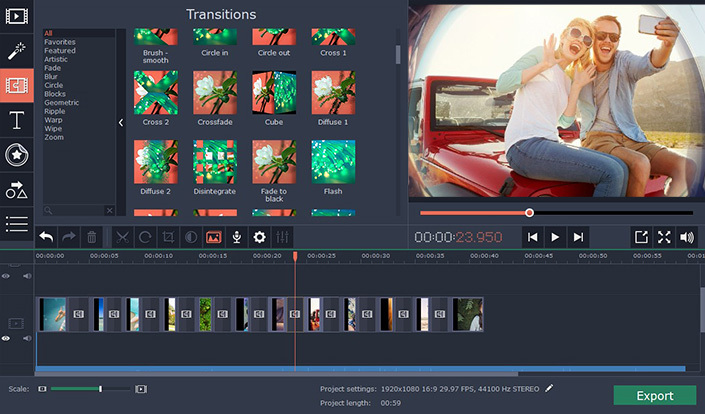 Transitions: With Movavi Video Editor, you do get a lot of transitions to choose from. For the current release, it houses 100+ transitions that would make your video look stunning! The transitions may not be super unique but if utilized correctly would surely make a difference! Effects: This is my favorite part in Movavi Video editor, for such a cheap price tag you get all the essential effects that are in trend currently. You can implement a slo-mo effect for a video with a dancer, make a video similar to Time Warp (seen on the discovery channel) using reverse motion, chroma key to change your background just like you use a green screen and also the tilt-shift effect which would come handy if you are making a cinematic experience filled video. You will find several more effects not being highlighted as you continue exploring it and using it to make a perfect video of your choice. Montage Wizard: With the new version rolled out (Movavi Video Editor 14), there is an add-on wizard which makes things automated and helps you get the video done without even exploring your recordings manually. For instance, if you had a trip (and did record a lot of videos). If you want to compile a video on your whole trip, just add all the videos and the montage wizard will handpick the perfect scenes and let you add your choice of music to finish making the video on your trip. It’s more like a video-editing assistant when you have a lot of files to pick from. Video Stabilization: It also lets you edit your distorted videos and show them as more stable recordings with a couple of tweaks. Built-in Media: You don’t need to look for filler clips, background pictures or audio endlessly. You get a lot of useful media along with the software installation. Audio editing tools: Of course, you should not expect a music studio software out of it. It lets you have control on your audio up to some extent. Beat detection: This is an advanced stuff to put in an affordable video editor software product. The beat detection feature helps you sync your video with the rhythm of the music that you’ve attached to it. Other features: You can also have picture-in-picture mode (multiple videos in one screen) and have the ability to capture video from the webcam or record audio for the voice over part. Movavi video editor for PC is available for free with some restrictions. However, if you want to unlock the complete set of features, you can get it for $69.95. However, there is special discount going on currently, so you can upgrade to full features for just $39.95. Keep in mind; this huge discount is only valid until November 2, 2017. So hurry up and get your copy of license before the discounted deal goes away. Also Read: KeepVid Pro for Windows: Is It the Ultimate Video Downloader for Windows? If you want a video editor that works on-the-go and could handle the video content creation projects that do not require super crazy tools and resources to enhance the video, then Movavi Video editor is a charm to use for just under 40 bucks! It certainly lacks some features that we encounter on major video editing tools, but considering it’s a super lite version of what you already have on the Internet – makes it a steal deal. The only downside of the free version, is that it adds a watermark to your edited video.